Spacious rooms. Nice balcony. Pleasant hotel grounds. Great view. Set in a prime location of Bagnan, Hotel Sonar Bangla Kolaghat puts everything the city has to offer just outside your doorstep. Featuring a complete list of amenities, guests will find their stay at the property a comfortable one. Car park, room service, restaurant are on the list of things guests can enjoy. Each guestroom is elegantly furnished and equipped with handy amenities. Take a break from a long day and make use of outdoor pool, garden, games room. 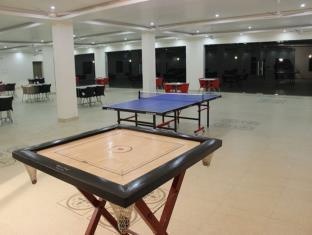 For reliable service and professional staff, Hotel Sonar Bangla Kolaghat caters to your needs. Very good family hotel. Good for sightseeing and close to the city center. Great pool. Great room. Restaurant location is fantastic. Outstanding river front and swimming pool. Ambience and location is very good. Clean and well maintained swimming pool. Outstanding river front and swimming pool. Pool is superb. AC worked well. Rooms are fantastic. Very spacious and awesome view of the river. AC worked well. Soothing and pleasant stay.. Very spacious and awesome view of the river. Clean and well maintained swimming pool. Rooms were good and cleaned. Room was neat and clean. Cycling also available for kids. Highlights are the facilities. Huge river front of the entire property. Staff is excellent. Hotel staff was very professional. Staff is prompt and courteous. There is no fruit in the breakfast. Breakfast was also with limited option. Food served in breakfast is not good. Intercom not working. There was no WiFi services. No Wifi in the room.